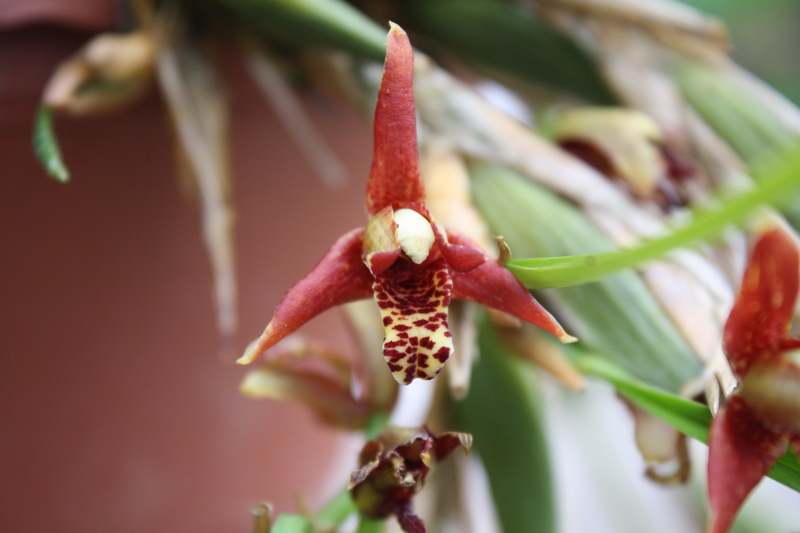 Maxillaria tenuifolia, also known as the Coconut Orchid. It has a strong fragrance (especially when it first opens) which smells like just like coconut suntan lotion. 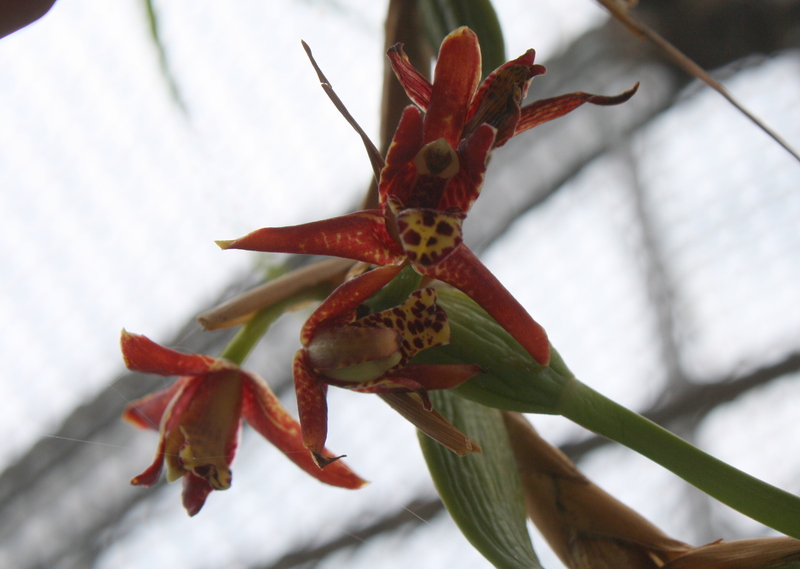 This species of orchid was discovered near Veracruz, Mexico by Karl Theodore Hartweg, a German botanist who collected plants throughout Mexico, Central America, and California, in the 1830s and 40s. It grows at low elevations from Mexico to Central America. 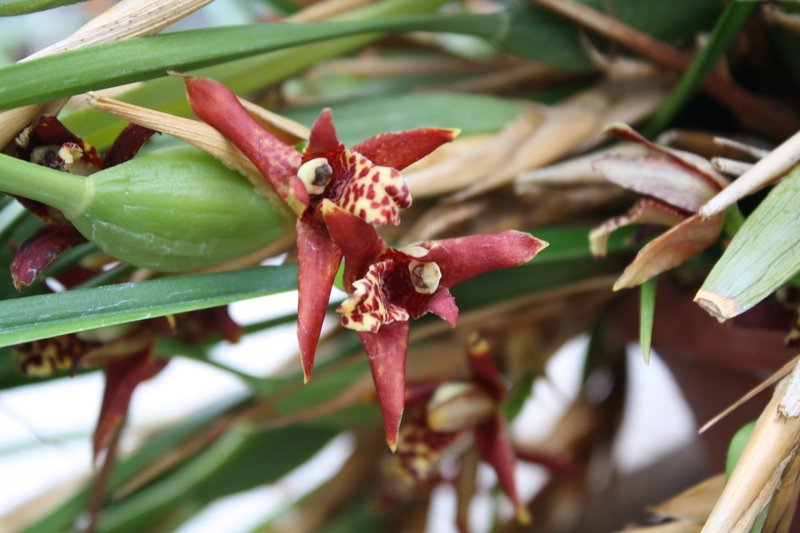 Orchids in the genus Maxillaria are not difficult to grow. The hard part is believing that they can get by with so little water! They like humidity but not wet soil. Because they are epiphytes, they can be grown mounted on bark or branches, or in coarse, well draining substrates such as pine bark or small stones, mixed with a little bit of potting soil. Bright indirect light is best. 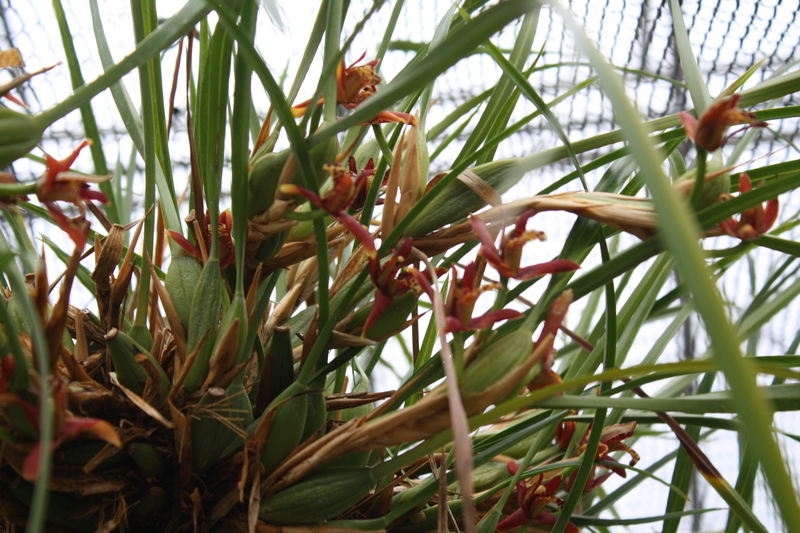 Maxillaria tenuifolia is propagated by the division of the pseudobulbs which you can see at the base of the leaves, growing from the creeping rhizome. The overall plant appears a bit straggly but looks nice in a hanging basket. Coconut Orchid has long strappy grasslike leaves, and the flowers are hidden in among the foliage. They are dark red to rust-colored, with a speckled lip. They are only about an inch and a half in diameter, but the fragrance is wonderful and delicious. This entry was posted in Botanical Gardens, Conservatory, Greenhouse, Photography, Plants and tagged beautiful flowers, greenhouse, horticulture, orchids on April 3, 2015 by uribg.